As you may have noticed, I have been re-posting several times articles about my interest In finding opportunities or remote/virtual positions. To date, I have had no success. As I may have mentioned in my previous post, “Now It’s Personal“, I was diagnosed with End-Stage Renal Disease, and have been undergoing peritoneal dialysis at home. The treatment is going well, but yesterday I began what will be a long, possibly three year process to get a transplant. As I am doing now, and will be doing in the future, I have been staying home to receive my dialysis supplies every two weeks, and going to the clinic for blood work and follow-up. In addition, I will have tests, and need to go down to Miami, so my schedule will not allow me to work full-time, or even part-time for twenty hours a week at some office. To that end, I am interested in any work any of you can pass onto me that will utilize my skills and experience. No matter where you are in the world, as long as we can communicate online, I can do something constructive and valuable. If you need my CV, I will gladly provide it upon request. I would not do this here if the other postings had been successful, and time is running short. This entry was posted in Employment, Health Admnistration, Health Care, Insurance, Medical Tourism, Medical Travel, position, Risk Management, Workers' Comp, Workers' Compensation and tagged Employment, Health Care, Medical Tourism, Medical Travel, opportunities, remote, virtual, Workers' Comp, Workers' Compensation on February 22, 2018 by Transforming Workers' Comp. Back to the real world of health care, et. al. Last week, The Atlantic magazine reported that the US health care industry has supplanted manufacturing and retail to become the largest source of jobs in the US. The article, by Derek Thompson, reports that for the first time in history, in the last quarter, there are now more jobs in health care than in the two industries that were the leading job engines of the 20th century. 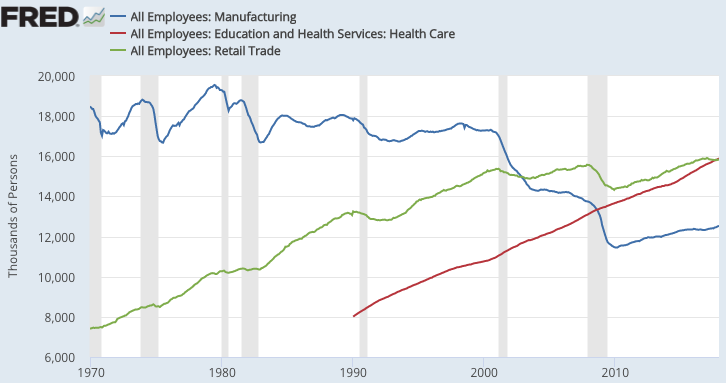 According to Thompson, in 2000, there were 7 million more workers in manufacturing than in health care, and at the beginning of the Great Recession, there were 2.4 million more workers in retail than in health care. Thompson says that there are three main drivers of the boom in health care jobs. First, Americans as a group are getting older. By 2025, one-quarter of the workforce will be older than 55 (your humble blogger). This will have doubled in just 30 years. It will have a profound economic and political impact, such as declining productivity and electoral showdowns between a young, diverse workforce and an older, whiter retirement bloc. [True in the last election.] The most obvious effect of an aging population will be that it needs more care, and more workers to care for them. Second, health care is publicly subsidized. The US spends hundreds of billions of dollars on Medicare, Medicaid, and benefits for government employees and veterans. [The recent tax bill passed will make substantial cuts to many of these programs, or outright privatize them.] The US also subsidizes private insurance through tax breaks for employers who sponsor health care. Finally, the growth in health care employment is more located in administrative jobs than in physician jobs. The number of non-physicians has exploded in the last two decades. Most of these jobs are administrative such as receptionists and office clerks. It is not clear that these workers improve outcomes for patients. So, while there is good news about the position of health care employment in the US, the downside is, at least as far as Medical Travel is concerned, that globalization may not have as much of an impact on health care as I, and others have thought, and that portends bad news for the industry. This entry was posted in artificial intelligence, Automation, Bleisure Travel, Employment, Globalization, Health Care, Medical Tourism, Medical Travel, retail and tagged Automation, Employment, Globalization, Health Care, Jobs, Manufacturing, Medical Tourism, Medical Travel, retail on January 15, 2018 by Transforming Workers' Comp.